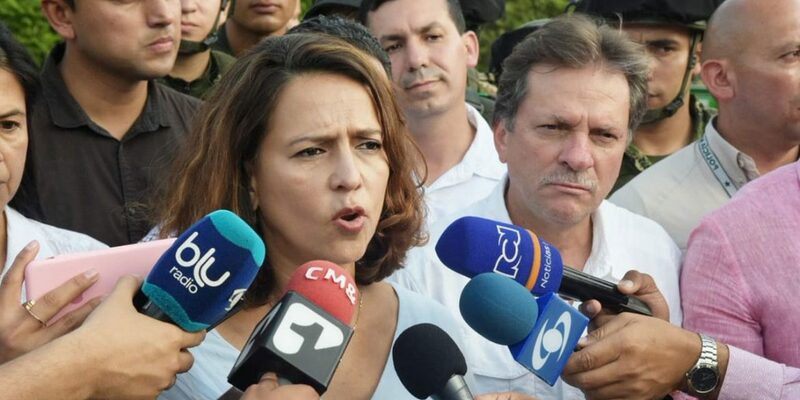 Interior Minister Nancy Patricia Gutierrez suspended talks with indigenous protesters after accusations that they had kidnapped a soldier in Colombia’s Cauca province. Indigenous leaders confirmed they briefly detaining the soldier after guards discovered he had entered the area around the protest armed but in civilian clothing. The man was handed over to the authorities in perfect mental and physical health, Defense Minister Guillermo Botero said hours after the incident. It’s not yet clear if or when the Colombian government will recommence talks with the protest leaders. Major Jhon Mondol Duque was off-duty on his way to visit his ill daughter, according to newspaper El Tiempo, and was travelling between the cities of Cali and Pasto. He had official permission to travel, but only by air. He was found on the road having disobeyed his order. “We are protecting the protest in indigenous territory, and immediately we proceeded to the usual process, to investigate whether he was a military or not. The guarantor organizations were called: the Ombudsman’s Office, the UN, but they said they could not mobilize at that time,” Sauca said. The protest is now in its third week consists of a road block on the highway connecting Colombia to Ecuador, in demonstration against government repression and Bogota‘s failure to engage in talks, specifically the failure of President Duque to arrive in the region for negotiations. President Ivan Duque has categorically refused to negotiate until the roadblock ends, and government officials are claiming that the demands, particularly around land rights, are simply not possible. Amid an increasingly complex security situation, the protest has also been subject to violent police repression, in which an unknown number have been injured. Afro-descendent Colombian citizens and indigenous communities from other areas, have joined the protest in solidarity. To support the protest, thousands of indigenous protesters from Antioquia traveled to Dagua, Valle del Cauca. The pressure is mounting around the blocked road, which is one of the main transit roads across Colombia. More than 5,000 tonnes of food – which has been unable to pass – will spoil in the next few days. More than a million US dollars are being lost every day by farmers and local businessmen.